So, it took Sunday night’s Oscars (and Jim Harrison’s The Raw and the Cooked) to get me thinking about movies and food, or more properly, food in the movies. I’m not talking about popcorn and slippery nachos washed down with a gallon of fountain soda here, I’m talking about movies in which food is actually consumed, enjoyed, celebrated even. Initially, this wasn’t the easiest train of thought to get going on since most movie stars appear to have given up eating several years ago, and many look like they wouldn’t know what to do with a nice, juicy steak, but the more I thought about it, the more films came to mind that concerned food. For example, in the past several years, we’ve had Willy Wonka and the Chocolate Factory (the recent remake with Johnny Depp), Chocolat, No Reservations, Super Size Me, Harold & Kumar Go to White Castle, and Fast Food Nation. Prior to that were such movies as Fried Green Tomatoes, Willy Wonka and the Chocolate Factory (the original version with Gene Wilder and his weird sweep-over), Mystic Pizza, and Jamon, Jamon. Okay, so I hate to be film-snob, but really. Apart from that fact that only one of these movies is really about enjoying food (Chocolat), and many of them are about what’s wrong in the world of food today (SuperSize Me and Fast Food Nation) there really aren’t many good food movies out there. I should say that I didn’t see No Reservations, but that’s because it looked gash on the trailer, and that during a brief web search I found that someone else had had written about this same thing (Brownie Points Blog) from where I cribbed some of the titles above, but when you visit that site, you’ll realize (if you recognize all the films – I had only heard of half of them) that most of them aren’t really about food. They are stories that revolve somehow around food (Jamon, Jamon) – love stories mostly (must be the sensual thing, I guess) in which food is a metaphor, but, sadly, food just as food is hardly ever the central thing. Why is this? And, why do you so rarely see people eat in movies? I mean, how often to you encounter movie scenes in which tables are laden with food, but nobody’s eating it? A lot, that’s how often. That’s why, apart from it being an excellent, thought-provoking movie, I really enjoy the scenes in Munich when the Israeli kill-squad are sitting around a table laden with brisket, vegetables and wine bottles, tucking in to a delicious meal. And, the other scene in the movie when Eric Bana’s character “Avner” is blindfolded and taken to lunch with Michael Lonsdale’s “Papa” and they all sit down and eat at a table for about thirty outside under a trellis — it’s a beautiful scene. To me, these scenes clearly show that even men focused on killing other men must eat, and when they do, it can be an enjoyable and life-affirming experience. So it depresses me that there are so many movies in which the cast are sitting at a table piled with delicious victuals and then, suddenly, it all goes west — someone gets shot or a fight starts or the dreaded monster arrives with the appetizers and the cast becomes it’s dinner and miss out on their own. Why is this? Perhaps a focus on food is missing because watching other people eat makes you feel queasy? But then, people very readily watch gory, slasher movies while wolfing down popcorn, soda, ice-cream, hot dogs, nachos and mike & ikes every weekend. And, why do you take your girlfriend/wife out for dinner if not to sit opposite them while they eat? No, it can’t be that. Is Hollywood trying to tell us something about the family dinner, or food in general? I’m remembering lots of occasions now when meal times get messed up in movies. For instance, Tim Roth and Amanda Plummer hold up a diner in Pulp Fiction spoiling the John Travolta and Samuel L. Jackson’s breakfasts, Kate Capshaw screams and passes out during dinner in Indiana Jones and the Temple of Doom (due to the chilled monkey brains, I think) which must have disturbed the other guests, and, the glutton in Se7en is tied to a chair and made to eat plate after plate of spaghetti before he finally carks it. Even worse, perhaps, Marlon Brando has a heart attack among the tomato canes in The Godfather. Is Hollywood attacking gardening — the source of food — too?! I think I’ve identified something sinister here that needs exploring, and in the spirit of figuring this conspiracy out, I’m planning to sign-up to NetFlicks and begin my lengthy research into why Hollywood hates food. Until this research is complete, please tell us what your favorite food film or food-focused movie scene is. It could be from a TV show too, if you’d prefer, but that’s almost another post in itself. 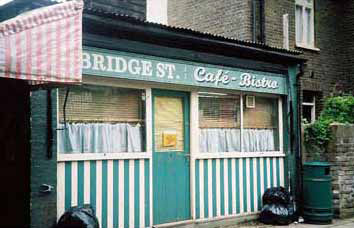 I mean, the cafe in (long-running and absolutely dreadful English soap opera) Eastenders always struck me as unnecessarily grim — ugly people swilling weak tea and sullenly pushing down plates of fried eggs, sausage and fried tomato to the sounds of some crappy 80s music on a crackly radio somewhere – the whole thing just looked insanitary. Then again, the entire show is depressing and ridden with ugly people, so why should the food by any different? Our fav – in the BBC TV version of “All Creatures Great and Small” – the dining room table is just as important as the surgery and barnstalls in terms of scenes and plot. And EVERY table scene in Series 1-3 had the characters eating (actually eating, swallowing, talking around food). So much so that my wife and I joked about watching “a breakfast or two” instead of watching “an episode”. Lots and lots of sausage and meat. It makes sense tho – a big meal before heading out for hours of work – eating farmer-style. Tampopo, hands down. It is a completely un-subtle celebration of the joys of gastronomy. I Like Killing Flies was pretty great. Thanks for bringing this up, it was a good read. She looks so thin in this picture!! On the other hand, I just HATE actress showing their anorexic bodies to the world!!! Lots of young girls want to be like them!!!! That is horrible! I don’t think I have ever seen her look so unhealthfully thin. Living in Southern California, you unfortunately see many women and girls who look emaciated like that. I’m a thin person who works out regularly, but seeing women like that is heartbreaking to me. Big Night is another all-out celebration of the glories of food. And the best scene of all is the final scene, where the two brothers silently make breakfast together after the hub-bub of the rest of the film.